The two guys in the picture above are Scott Taylor, the mechanic/engineer doing most of the work on the car. Next to him is an old time friend, Giovanni d’Avola, who has a larger shop in Chicago. They worked together at a Ferrari shop c. 1980 for some time.Giovanni did some of the work ont he car – rebuilding the distributor, generator, and starter. The engine is now built, and in the car. Fitting the bearings and all the loose ends took some time. Water systems check out, electrical is being finished, fuel linkage in place. Valve covers will be painted upon return to the body shop to install the interior. Remaining work involves exhausts and final fitting of driveshaft. 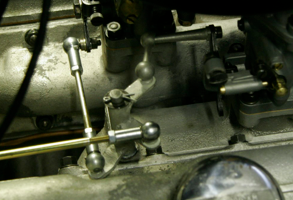 The carb linkage is a thing of beauty. Difficult to describe, but one rod comes from the firewall and operates a bell crank that swings linkages in two different directions for the two carbs. Someone had a lot of skill to figure that out. The fuel pump was difficult – the two pumps we had were both damaged, and the newer later one we got had some oddities. Clearance to the underneath of the steering column is very tight. Scotty is very meticulous on fuel pumps, and checks the rod/spacer lengths carefully to get 2.75 – 3 psi pressure. He’s very suspicious of too much pressure resulting in washdown of cylinder bores. There were three different style fuel pumps used in the early series cars(s. 1-3 B20), but only one type Fispa pump in the second series (s. 4th-6th B20), so its all a bit confusing. So we have a case from one, guts from another, and a top cover from a third. Exhaust headers were with the car originally, and look very 1950’s Italian custom welded up, 3:1 headers. Hopefully it will start up this weekend. Fingers crossed. I see on your foto that you have two carburetors but not Nardi ? is it possible to say me what are these carburetors?Weber ?simple carburetor?Is it possible to have foto of this very interesting assembly?Is it possible to do the same thing on my B24 ? The carburetion on the cars varied by model. Its a bit tricky, but the simplest way to understand it is that the 2.5 liter motors typically had one Weber two barrel, and the Nardi conversion is for putting two of these Webers on. 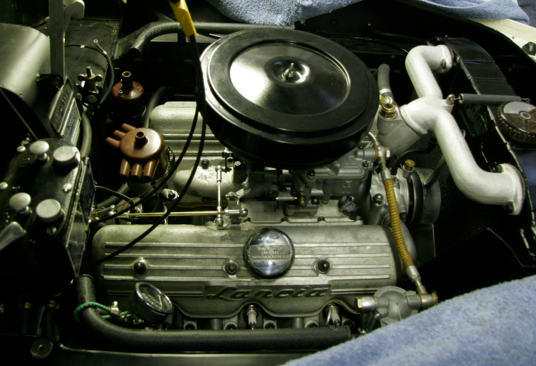 Carburetion for the earlier cars (1.8 and 2 liter) is different. On the s.1 and s.2 B20s, there were two single barrel Webers as stock setup. This early setup (and the Nardi conversions) will not fit on the later cars (nor are they interchangeable between the s.1 and s.2 either!) and is not quite simple – as these early carburetors are very hard to find. The later 2.5 liter setup is more standardized, and the Nardi setup for the 2.5 liter engines is interchangeable between s.3 through s.6.